Lead in partnership by Mike and Mique’l Dangeli, Git Hayetsk is an internationally renowned Northwest Coast First Nations mask-dancing group located in Vancouver, British Columbia. Git Hayetsk means the people of the copper shield in Sm’algyax which is spoken by the Nisga’a, Tsimshian, and Gitxsan Nations. Our dancers are bonded by their common ancestry to the Sm’algyak speaking peoples with distinctions in their family ties to the Haida, Tlingit, Haisla, and Musqueam Nations. Our home and ancestral villages are located in Southeast Alaska, Vancouver BC and along the coastline of the Terrace-Prince Rupert area including the Nass and Skeena Rivers. The inspiration for our name is the copper shield. It is the most prestigious form of ceremonial wealth among the Northern Nations of the Northwest Coast. Owned by only the most high status people in our culture, it is made out of hand-pounded copper ranging in size from several inches to 4 feet tall. Its standard composition represents an ancestral being with its ribs and backbone made prominent by the raised T-shape in the center. Of its many meanings, copper shields also symbolize wealth, prestige, power, strength, and peace. As our ancestors have since time immemorial, we bring out copper shield at our ceremonies today to assert our hereditary rights and privileges. Since 2003, we have shared our songs and dances at ceremonial and public events in urban and rural communities through Canada, the US, and abroad including British Columbia, Ontario, Manitoba, Alaska, Washington, Oregon, Idaho, Ohio, Hawaii, Washington DC, Austria, Malaysia, Germany, and Japan. is of the Nisga’a, Tlingit, Tsetsaut, and Tsimshian Nations. He grew up in his people’s tradition territory in Southeast Alaska and Northern British Columbia. Mike is a renowned artist and carver. His work is collected and exhibited throughout North America and Europe. He is a singer, songwriter, and dancer. In partnership with his wife Mique’l Dangeli, Mike leads the Git Hayetsk Dancers – an internationally renowned First Nations dance group based in Vancouver, BC. 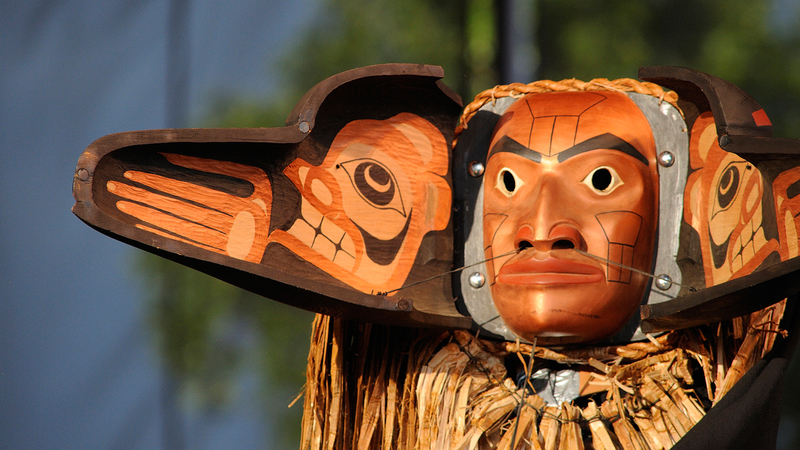 He has carved over 50 of the masks performed by their group. was born and raised on the only Indian Reserve in the state of Alaska. She is of the Tsimshian Nation of Metlakatla Indian Community. Mique’l is currently a PhD Candidate in the department of Art History, Visual Art and Theory at UBC. She specializes in Northwest Coast First Nations Art History. Mique’l served her community for eight years as their Museum Director. She is a curator, author, dancer, choreographer, and co-leader of the Git Hayetsk Dancers. She has choreographed a large body of dances for newly composed songs among her nation as well as created new dances for ancient songs whose dance has been lost during their cultural oppression. Produced by Mique’l Dangeli & Natalie Dobbin in FIPR 469A, UBC.